Well, in spite of my best intentions, the last week of December and the first week of January zipped by, and I didn't get a lot of the items on my to-do-list crossed off. I did go to Virginia last week to visit my family. While I was there I spent some time in the public library. I had been using the New York Times for research on 1939. A terrific newspaper that I turn to often for all kinds of research -- but not a researcher's friend if she is trying to read (or, at least, scan the headlines) of an entire year. I can search by topic, but I wanted to see entire issues of a newspaper. So I spent five hours going through as much as I could of my hometown newspaper and getting a better sense of how the news of the year was being reported. That worked well because one of my characters departs from "Gallagher, Virginia" en route to New York City. It also worked because the Danville Register used the same wire services as the big city newspapers. I'm hoping to get the microfilm through interlibrary loan and continue reading. Now, I'm juggling -- going back and forth between the 1939 book, my dress and appearance in crime justice book proposal (the first draft is done), and editing the manuscript of the third book in my Lizzie Stuart series (that is being reissued). I also have several backburner projects that I need to get started, and school is about to begin. So I'm taking a time-out next week to simply focus on finishing everything I can get done. I'm going to check my email only once a day -- in the evening. I am going to work at home and in the library. And I'm planning to get the updated proposal for the dress and appearance book and the first 50 pages of the 1939 book out to my agent before our upcoming lunch in NYC. The good news is that an anthology to which I contributed a short story is now available. It was such a fun story to write. This anthology features "The Bronze Buckaroo" (and is available in both print and ebook. 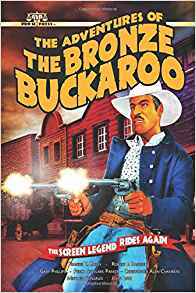 The Bronze Buckaroo was a "singing cowboy" who appeared in a series of movies in the 1930s. These movies was intended for an African American audience. The "race" movies in various genres featured mainly African American casts and played in segregated theaters. In his other life, the actor, Herb Jeffries, was a smooth-voiced singer who signed with Duke Ellington in the late 1930s. My story is a genre-blender -- western/mystery/romance -- inspired by the films and by the cowboy serials that I used to watch as a kid. The movies can be found on YouTube. My other good news -- something I'm excited about -- is that I've been invited to join the 2019 faculty for the Yale Writers' Workshop this summer. I'll be one of the instructors for Session II in June, devoted to genre fiction and nonfiction. I've already started to prepare. I can't wait to see the Yale campus and hang out with writers from different genres and students from all over the country and international. If you are interested the website is up and registration is open. But right now, I've got to get to the office before the day is over and do some work there.